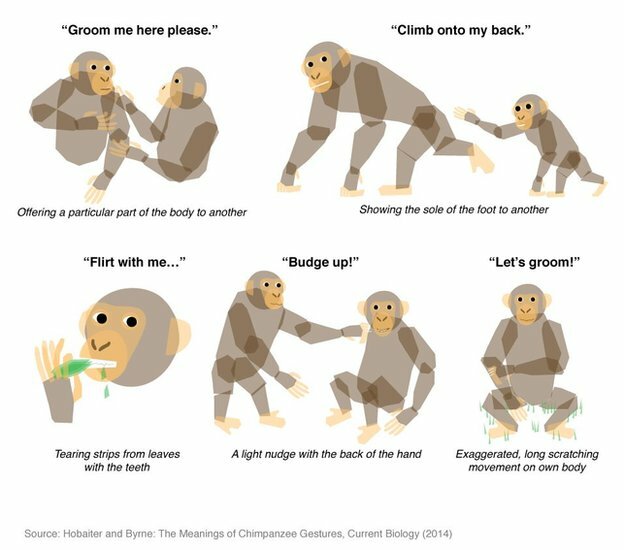 Researcher’s from the University of St. Andrews have published a paper in Current Biology which deciphers specific gestures that chimpanzees use to communicate. The 66 gestures differ from the other communications identified in monkeys and great apes in that they are intentionally directed at specific individuals rather than messages sent broadly to a group. Dr. Catherine Hobaiter, who led the research, determined the “lexicon” of gestures from over 5,000 incidents of communication. Read more and see video of the chimps in action at the BBC.